We’re now more than half way through my year of Travel Timehop posts and I have to admit that as each week begins I wonder what trip I am going to write about next. But a quick flick through our photos from the past decade always brings the memories flooding back. This week’s timehop is from our first dog-friendly holiday. It was January 2012 and we had decided to book a last minute New Year get away. This was in the days before our caravan so we needed to find somewhere suitable for Tin Box Dog. 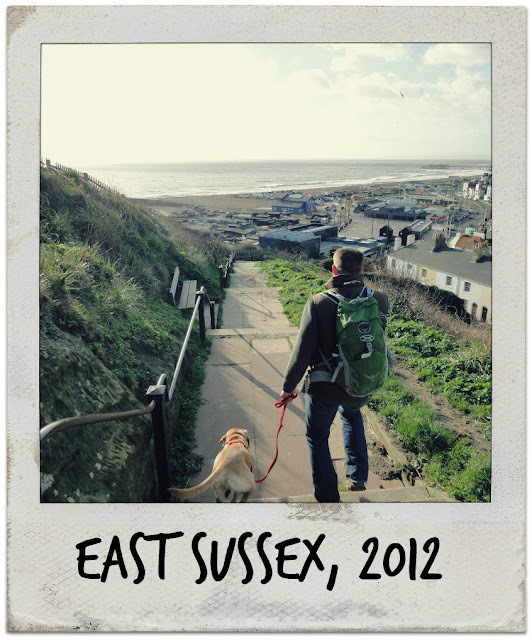 We found a dog-friendly cottage on a farm in Battle, East Sussex. I remember being a little bit nervous about taking TBD somewhere she could chew up furniture that wasn’t ours – she was only eight-months-old and still had little ‘mishaps’ from time to time. The cottage was a beautifully converted farm building. At one end there was a luxurious bathroom and at the other was a small double bedroom. In between was a spacious open plan kitchen/diner and lounge with a wood burner. The owners had left a range of interior design magazines on the sideboard and it was clear they had used them for inspiration. Luckily TBD was on her best behaviour. Probably because she was so knackered from all the walking. A part from the first day when it hammered down with rain, we were really lucky with the weather and managed a few walks from the cottage. Battle is the site of the Battle of Hastings in 1066. Unfortunately Battle Abbey was closed while we were there but I’ve heard it is worth a visit. You can tour the abbey, see historical reenactments and visit the museum to find out all about King Harold and William the Conqueror. One day we decided to drive out towards Hastings for a walk and parked up in Hastings Country Park to the east of the town. I took this photo as we were walking down into Hastings. I remember thinking that welcoming TBD into our home had made us a family (dog people will know what I mean). It was just over a year later that we grew our family a little bit more and welcomed the first of our non-furry babies into our home.